Most of these parts include separate units that play an important role and therefore nees further discussion. In the following text an introductory description of all these units is presented. In depth analysis will follow in separate articles. Its front panel becomes the base of loudspeaker radiation. It is called 'baffle' and draws our attention during design. Its cavity is responsible for the absorption of a major part of sound spectrum emitted by loudspeakers' back openings. For this reason a sound absorptive or damping material like wool is placed into speaker enclosures. At low frequencies the air enclosed by this cavity (which is a typical compressible gas) resists the motion of loudspeaker cone. This is also an effect to be taken into account. It limits the ability of the speaker to reproduce very low frequencies or bass. 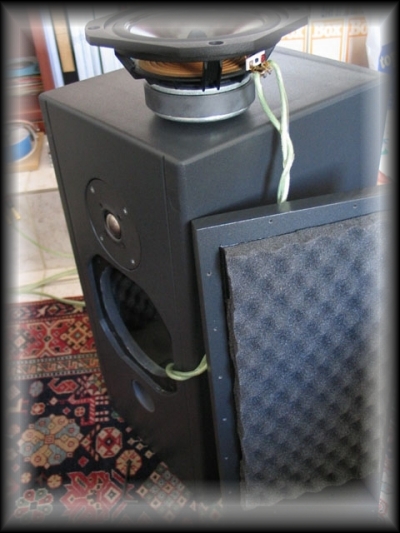 Mounted in an enclosure's hole most speakers carry a short tube called Port or Vent. Its use is surely not to ventilate anything at all! It receives low frequency waves propagating into the cabinet and emits a small part of them acting as a filter. 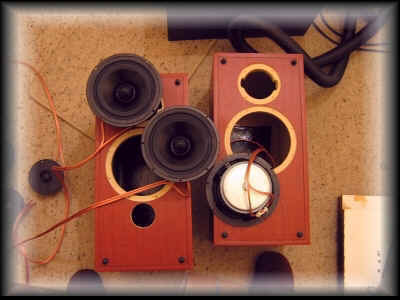 Its output adds to what the rest of the loudspeaker emit from the baffle. Needless to say that a vent needs a very careful design of its dimensions. Last comes the Grid or Grille usually covering the baffle either in part or as a whole. The cloth used for its construction creates some additional absorption at high frequencies and one needs to take it into account also at design steps. Loudspeakers are electromechanical devices (also called transducers) which receive electrical signal and convert it to mechanical vibration of their diaphragm. It is this vibration creates sound waves. 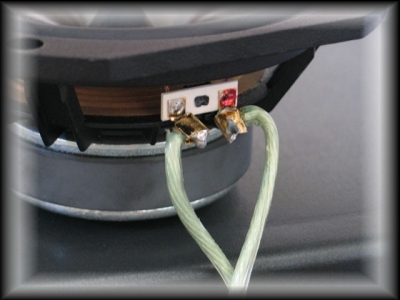 Woofers are responsible for the reproduction of very low (10-50Hz),low (50-140Hz) and middle (150-400Hz) sound frequencies. Midrange or squawker is another sort of loudspeaker or "driver" which emits frequencies in the range 300-4000Hz. Its relatively smaller radiating diaphragm is either cone or dome shaped. Tweeter is the smallest driver which is assigned the reproduction of high frequencies (3000-22000Hz). Its diaphragm is almost always dome shaped. Each speaker contains a Crossover or Dividing Network (or simply Circuit). A Crossover Network is a set of electrical filters made of resistors, inductors and capacitors. We need one filter for each loudspeaker we have in our speaker system. If our speaker is a two-way system we have one (or more) woofers to handle the low frequency part of sound signal and a tweeter for the high frequency part of the sound spectrum. 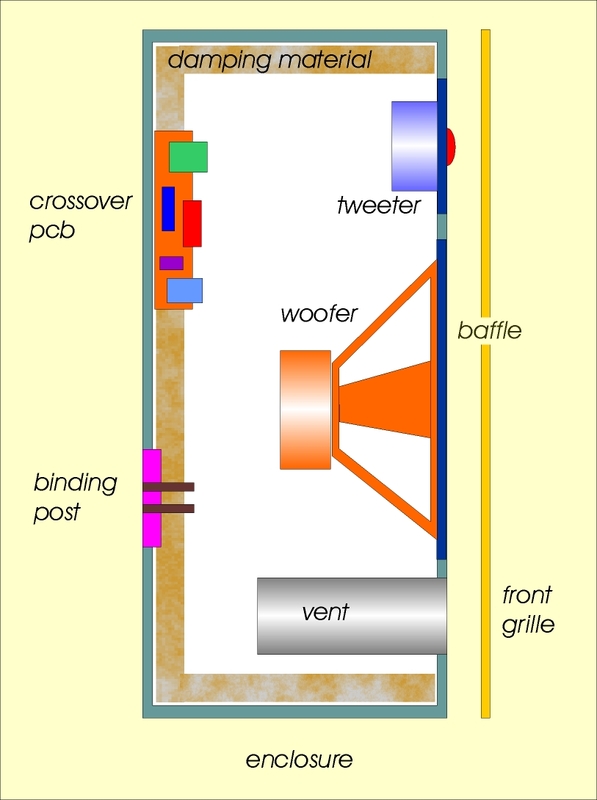 Thus we need a low-pass filter (LPF) to be connected to the woofer and deliver only the low frequency range to it and a high-pass filter (HPF) to be connected to the tweeter and furnish the high frequency range of the sound spectrum. 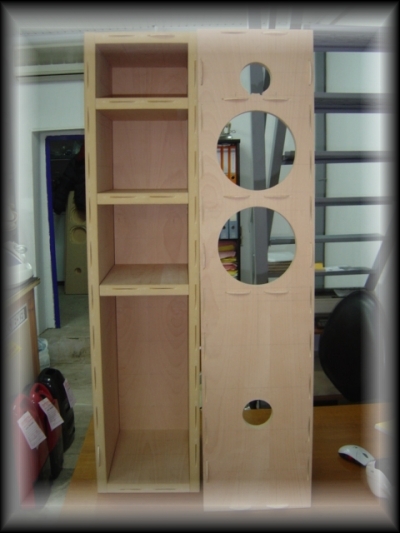 In the case of a three-way speaker we add a third loudspeaker for the mid-frequency range (the midrange or squawker) and its associated band-pass filter (BPF), a filter cutting both low and high frequencies. 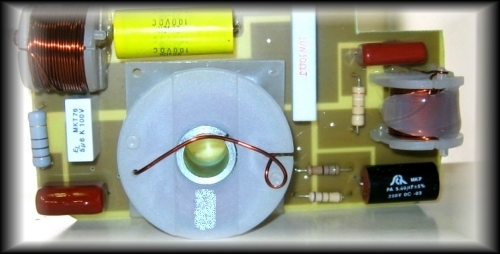 The inputs of all these filters (connected in parallel) receive the same electric signal that the amplifier delivers to this speaker system. Crossover Networks are assembled on Printed Circuit Boards (PCB's). Their design is difficult and challenging. 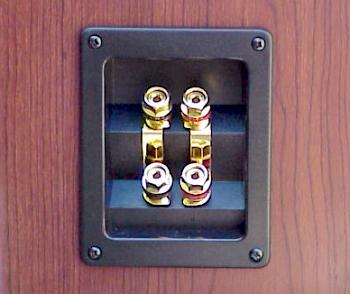 Input Terminals or Binding Posts are usually gold-plated screws placed onto a plastic assembly. Several meters of cable are needed to connect them to Crossover PCB and the latter to loudspeakers. Since signal voltage polarity is to be preserved a red/black pair of conductors (or any other sort of visually identifiable) is preferable. Currents flowing into loudspeakers can momentarily become very high so only thick conductors should be used.